Andreas is an instrumentalist and composer born in 1994 in Larnaca, Cyprus, currently living and working in the UK. Born in a family with long musical tradition, Andreas took his first steps in music education at the age of four, studying violin with Stefanos Zymboulakis. He also studied piano, classical guitar, electric guitar and music theory in the Classical Conservatory of Larnaca under the tuition of Marios . Graduated from Royal Holloway University of London in 2017, he studied composition with Mark Bowden and specialized in electric guitar Performance under the tuition of Nick Hollings, whilst now he is undertaking his Masters Degree (at Royal Holloway) specializing in Performance under the supervision of Dr. Mary Dullea. Andreas’ orchestral experience began from an early age as a member of Larnaca’s Violins Orchestra, for which he will lead the first violins by the age of fourteen. At the age of eighteen he joined the Military Band of Cyprus for which he served as a second trombone, as well as bass guitarist in the “light” folk orchestra of Σ.Μ.Ε.Φ (Military Music of National Guard). He was also a member of the Royal Holloway Symphony Orchestra under the baton of Rebecca Miller. Despite his heavily ‘classical’ influenced education, his passion for electric guitar and popular music culture was expressed from an early age. Studying electric guitar with Pavlos Chrysanthou and later on with John Savvides, Andreas started working as a session lead guitarist and studio recording guitarist at the age of fifteen. 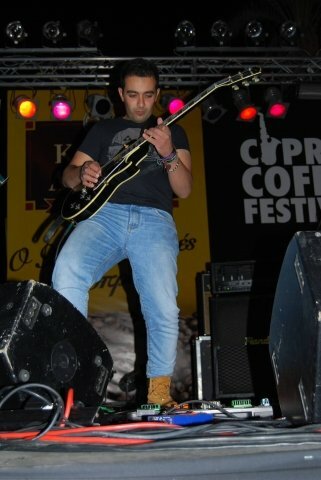 He was the co-founder and lead guitarist of the rock bands Virtus, ΠΛΑΝ Β, and Zmepherz touring in Cyprus, and has collaborated with various artists including Andreas Moyseos, Demetris Mesimeris and Marios Panayi. One of his latest collaborations was with Michalis Georgiou, recording both the bass and electric guitars for his debute album " Ta fota tis skinis (trns. Greek)". There is no such thing as a definite approach. Andrea's approach is personalised, based upon the following key factors of the student: Age, Capabilities, Hours available for the student to practice at home, and the student's goals. It is not a secret among musicians that talent would be only the 5% of the whole, whilst the rest 95% is derived from student's systematic practice. Some specific practices will also be a part of the learning environment and plan. Andreas believes that to grow instrumentally, a student should also grow musically. This does not only include aural exercises, and/or music theory&analysis, but working on the critical thinking of the student based on literature, writings or discussions in academic circles. This may include various philosophies in music's role, psychology of music, philosophy of education and more. For Andreas, is of utmost importance that a student would search for his personal feelings when performing a piece of music, expressing them through their playing, making each performance a unique interpretation of a musical work. In addition, the students will have the opportunity to choose their genres of main focus, as Andrea's musical vocabulary ranges from classical, contemporary, rock, blues, bluesrock, rock&roll, fusion, ethnic, folk, country and metal.